CHINE – Mogao - For decades, archaeologist Li Zhirong of Zhejiang University in Hangzhou, Zhejiang province, has been frustrated with her study of China's Buddhist archaeology - or to be more precise, the hundreds of murals in Mogao Gottoes in Dunhuang, Gansu province. These murals, exuberant with color and movement, dating back thousands of years, await study by scholars. But they are gradually rotting away in the adverse weather conditions of the desert. Another threat: moisture from the likes of human breath. But a couple of years ago, Li started to work with scholar Diao Changyu and things started to improve. By the end of December 2012, more than 50 of Mogao's fragile colorful murals had been preserved in digital images, an important milestone for the conservation of one of the world's most precious historical relics. 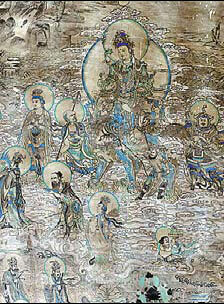 On the ancient Silk Road, the Mogao Grottoes were first constructed in 366 AD. One of the world's richest museums of Buddhist art, the site houses 45,000 square meters of murals and more than 2,000 painted sculptures in its 492 grottoes. ROYAUME UNI – Londres - British archaeology has enjoyed a surge of interest of late, with the recent unearthing of Richard III in a certain Leicester car park. 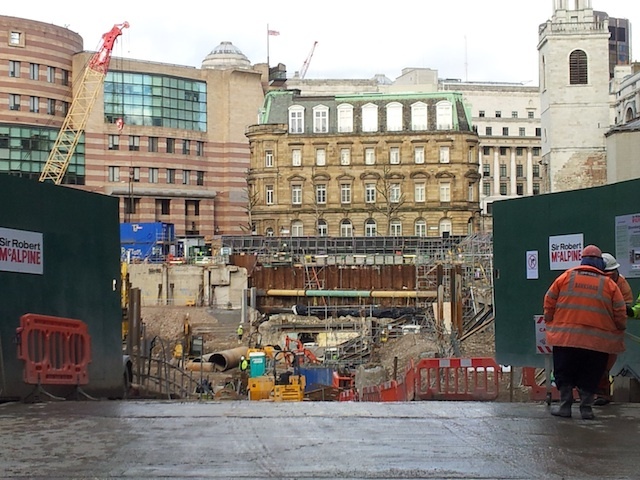 However, one London archaeological site remains in limbo: the Temple of Mithras is still waiting for its new home, as one of the City’s biggest ever digs continues. The temple, dating from 240AD, has been dismantled and is currently in storage with the Museum of London. It’s awaiting a permanent home in the rebuilt Bucklersbury House on Queen Victoria Street, which is set to be the European headquarters of media giant Bloomberg LP. Part of the delay has to do with ongoing excavation work on the Queen Victoria Street site, which has evolved into the Walbrook Discovery Programme, one of the largest digs undertaken in the City of London, according to MOLA, with more than 50 archaeologists combing through the mud of the Roman River Walbrook. “The ground conditions are perfect for preserving organic remains and hundreds of metal, wood, bone and leather artefacts and wooden structures are being recovered and recorded,” MOLA says. “These finds will contribute to our understanding of life in this part of Roman London and will help to tell the story of the development of the Mithras site.” The dig has uncovered the original foundations of the Temple of Mithras, which will inform a more accurate reconstruction. “Bloomberg LP will restore the temple to its original Roman location and in a more historically accurate guise,” says MOLA. “Upon completion of Bloomberg’s new development, the new reconstruction of the Temple of Mithras will be housed in a purpose-built and publicly accessible interpretation space within their new building.” The Temple of Mithras was dedicated to the Mithraic cult, which spread across the Roman Empire between the 1st and 4th centuries AD. The temple was a low, cave-like building and was in use for about 100 years. It was later rebuilt and dedicated to the god Bacchus. The temple was rediscovered by chance in 1952 by the archaeologist WF Grimes, and caused something of a stir at the time, with crowds of Londoners queuing up to see the dig. On the final day of excavations, in 1954, the team discovered the marble head of a sculpture of Mithras, one of the biggest finds from the site and a key artefact of Roman London. The temple’s history has been somewhat chequered since then: put into storage for the first time from the mid-50s until 1962, the remains were reconstructed (badly) 90 metres from the original site, nine metres above the original level and set in modern cement mortar. Chipping away that mortar has complicated efforts to rehouse it: Bloomberg had to hire expert stone masons to free the remains, according to the Museum of London. CHINE – Xi’an - The preservation of immovable historic relics displayed in large open spaces like China's world-renowned Museum of Qin Terracotta Warriors and Horses requires air curtains and other modifications to recreate the primitive environment from which archaeologists excavated the relics. That's the conclusion of a study of environmental control measures for archaeology museums in the People's Republic of China. Their study appears in ACS' journal Environmental Science & Technology. ZhaoLin Gu and colleagues point out that environmental factors have deteriorated many of the more than 1,500 unearthed relics in China's Museum of Qin Terracotta Warriors and Horses, for instance, and in other museums involving large open spaces. The Qin museum covers an area of more than 17,500 square yards, almost three football fields. 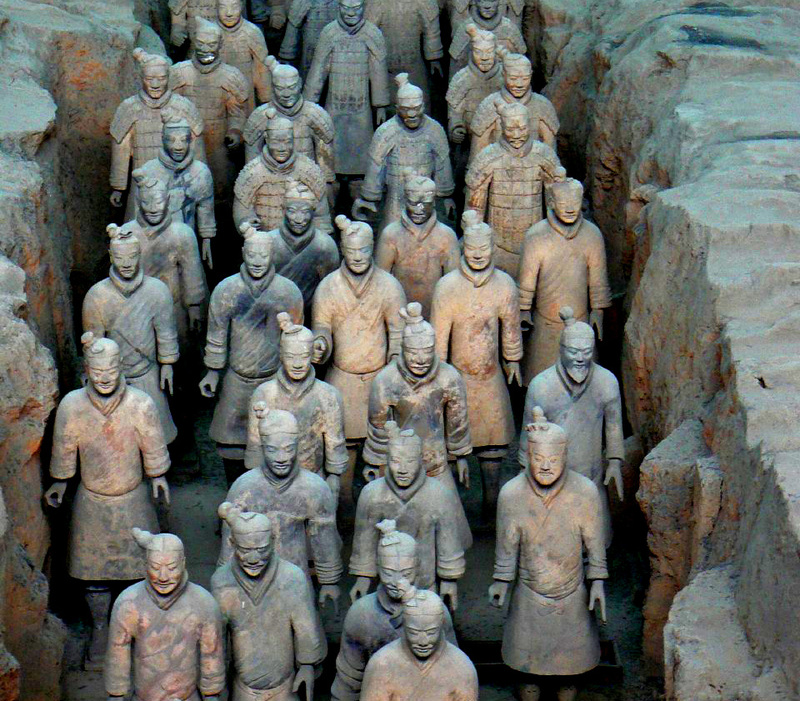 More than 5 million people visit the museum every year to see the life-size terracotta figures of warriors and horses uncovered in the mausoleum of Qin Shi Huang, who was born in 259 B.C. and became the first Emperor of all China. The study recommends new measures to better preserve such artifacts. One, for instance, involves use of an "air curtain" that would blow across the space to separate the figurines in the Qin Museum from the outside environment. The air curtains would keep pollutants and heat away from the inside of the pits. A layer of cool air would also be used in the bottom of the pits to help form a blanket of stagnant air around the relics for protection from the environment. HAWAII – Honolulu - The Honolulu Authority for Rapid Transportation (HART) has completed the fieldwork required for an archaeological inventory survey (AIS). The study became necessary after the Hawaii Supreme Court ruled last year that the State Historic Preservation Division (SHPD) violated its rules by giving the rail project the green light to proceed before an archaeological survey was completed for the entire rail route. In response to the ruling, HART temporarily halted construction and sped up work to complete the AIS on the portion of the route not yet surveyed. Archaeological remains were found at seven sites, all in the City Center section. HART set up a protocol for the treatment of such finds in coordination with the SHPD, the O'ahu Island Burial Council and other stakeholders.